Appetizer Roundup: 6 Favorite Appetizers Revisted | What about this? “Ugh, I have to bring appetizers again! Any ideas on what I should make for the party next week?” grumbled my daughter. “Why don’t you check out the appetizer recipes on my blog?” I replied, trying not to smile. “You could make “Bloomin’ Onion Bread, Pepperoni Pizza Puffs, or Kate’s Cheese Squares. They’re always crowd-pleasers. You could make something healthy like a Trio of Dips served with crudités. Or, if you’d rather bring something more exotic, make Sushi Casserole or Banh Mi Bruschetta,” I suggested to her. “Oh, I don’t know . . . . I’ve got to think about this,” sighed my daughter. 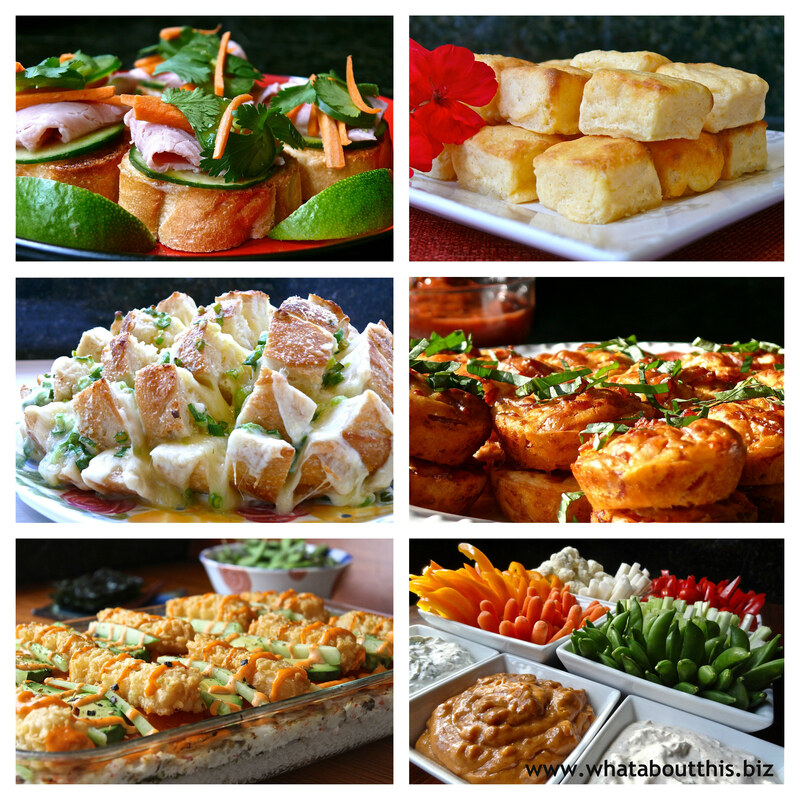 That conversation reminded me of some of the great appetizers that I’ve prepared in the past, so I thought I would revisit them – just in time for holiday and New Year’s entertaining! Bruschetta with a twist or Banh Mi simplified? Either way, this appetizer brings together some incredible flavor combinations. Sourdough bread, Monterey Jack cheese, butter, green onions, garlic powder, and Parmesan cheese . . . need I say more? This recipe serves a crowd and can be easily adapted. What ingredients you layer and the order you layer them is part of the fun in making this appetizer. Sushi rice will always be the base layer, but be creative with everything else! A tried and true recipe that’s been around for decades is the best way to describe these cheese delights. They are light in texture, yet sinfully rich. The smell of these small puffs of pizza will drive you crazy while they are baking, but they will be even more irresistible fresh out of the oven. They are best eaten hot, but they’re never around long enough to cool down! Healthy does not mean blah. These three dips paired with fresh vegetables creates an explosion of flavors and colors!